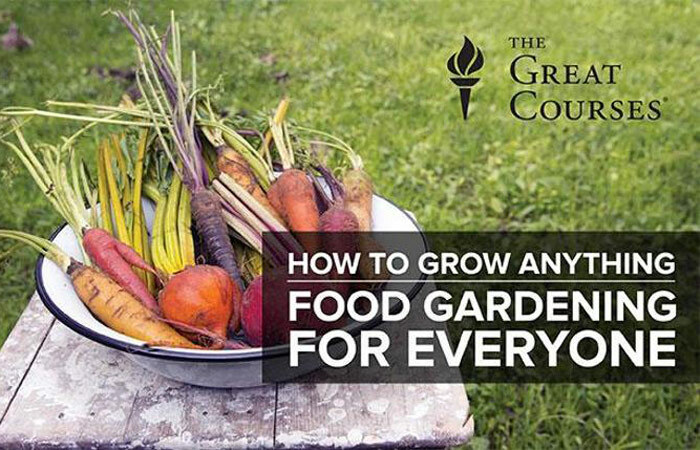 Grow your green thumb  and any food you please! Learn smart strategies for veggies, fruit and more that make bringing fresh food to your table a breeze. When you grow your own food, you get delicious flavor and a lower grocery bill! Join horticulture expert Melinda Myers and discover her insider tricks for growing carrots, peppers, raspberries and so much more. Get inspiring ideas for a successful garden design, whether you have a spacious backyard or a city apartment, before digging into what makes an ideal soil composition and discovering the best ways to extend your growing season. Then, explore basic maintenance and care principles: plant selection, soil prep and pruning, to grow a variety of vegetables, fruits and fruit trees. You’ll also get a blueprint for “low input” gardening, and see how to boost your garden’s output with Melinda’s harvesting tricks. Plus, make your own compost and find out how to protect your plants from frost for more yield from your garden. From sprouts and micro-greens to windowsill herb gardens and other edible container gardens, you can begin growing your own delicious foods any time of year. Discover the many benefits of growing your own fresh food, and learn what supplies you’ll need and how to arrange your plants. Scope out your growing space with inspiring ideas. In this lesson, find out what’s possible, whether you have a spacious suburban backyard or a city apartment. Discover insider tips for spacing and designing your edible landscape that will set you up for a successful growing season. Every successful garden begins with a good foundation. Here, you’ll find out what makes an ideal soil composition. Plus, you’ll learn several techniques for quickly repairing your soil and preparing your garden bed, as you explore instructor Melinda’s own garden. One of the best ways to extend your growing season is to start plants from seed indoors. Explore the materials and techniques for starting such common plants as tomatoes, peppers, melons, cabbage and more from seeds. And, get tips for watering, lighting and transplanting that will ensure a successful migration to your outdoor garden. Whether you start from seeds or buy young plants from your local nursery, vegetables and herbs are easy projects the whole family will love. See how to prep the soil and plant seeds for onions, corn, carrots, potatoes and more, before turning to transplanting and growing different types of tomatoes, peppers and squash. Discover ways to reduce your maintenance time and increase the success of your garden, no matter how busy your life may be. Get a blueprint for “low input” gardening, including time-saving strategies like proper weeding techniques, mulching for weed control and water conservation, and more. For some gardeners, the shift from growing vegetables and herbs to growing fruits may be overwhelming. The good news is that the same basic maintenance and care principles apply: plant selection, soil prep and pruning. Boost your confidence, with easy guidelines for growing small fruits, including strawberries, raspberries, blueberries, grapes and more. Once you’ve tackled vegetables and small fruits, there’s nothing holding you back from moving to large fruit trees! Because there are so many varieties available, from apples and peaches to pears and plums, Melinda shares general guidelines for selecting and planting trees. And, she walks you through training and pruning your plants for greatest productivity. When you grow your own food, you’ll probably tolerate a few more imperfections than you would with food from the grocery store. But you’ll still want to mitigate the harm from pests and diseases. Here, you’ll find out many of the most common pests and learn how to manage them in order to maximize your garden’s productivity. All parts of gardening can be fun, but nothing beats harvesting the fruits of your labor! Find out how to boost your garden’s output with Melinda’s harvesting tricks. And, learn some differences between fruits and vegetables, and find out when to harvest the most common plants in your garden. Plants come with a good bit of debris, including weeds, leaves and overripe fruit. Composting is a great way to turn those scraps back into organic matter for your garden! After sharing the basic process — which is easier than you might think — Melinda will show you how to build a worm composter. No matter what part of the country you live in, the growing season inevitably comes to an end. To squeeze out a bit more yield from your garden, delve into several ways to protect your plants from frost as you explore cold frames, hot beds, greenhouses and more. Plus, see how to preserve your herbs over the winter. Once you ” target=”_blank” rel=”nofollow”>purchase find your class in your class library. Melinda Myers has more than 30 years of horticulture experience. She has authored more than 20 gardening books, including Small Space Gardening (Can’t Miss series) and Birds & Blooms’ Ultimate Gardening Guide, and she is a columnist for Birds & Blooms magazine. She has also hosted The Plant Doctor radio program, seven seasons of Great Lakes Gardener on PBS and the nationally syndicated YardWorks. I have experience growing growing fruit trees and dealt with a lot of problems. But wonderful feeling when to care it day by day. Thanks for sharing!